WikiLeaks has published a new batch of the ongoing Vault 7 leak, this time detailing a tool suite – which is being used by the CIA for Microsoft Windows that targets "closed networks by air gap jumping using thumb drives," mainly implemented in enterprises and critical infrastructures. Air-gapped computers that are isolated from the Internet or other external networks are believed to be the most secure computers on the planet have become a regular target in recent years. Dubbed Brutal Kangaroo (v1.2.1), the tool suit was allegedly designed by the Central Intelligence Agency (CIA) in year 2012 to infiltrate a closed network or air-gapped computer within an organization or enterprise without requiring any direct access. The previous version of Brutal Kangaroo was named as EZCheese, which was exploiting a vulnerability that was zero-day until March 2015, though the newer version was using "unknown link file vulnerability (Lachesis/RiverJack) related to the library-ms functionality of the operating system." Like most air-gapped malware techniques we reported on The Hacker News, this hacking tool first infects an Internet-connected computer within the target organization and then installs the Brutal Kangaroo malware on it. Even if it's hard to reach an Internet-connected PC within the target organisation, they can infect a computer of one of the organisation's employees and then wait for the employee to insert the USB drive into his/her computer. 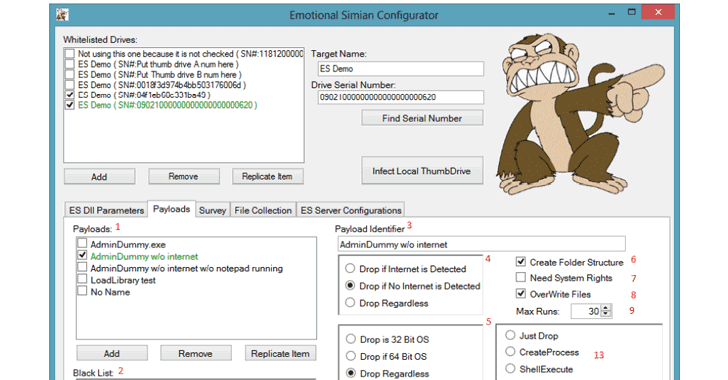 Now, as soon as a user (the employee of the organisation) inserts a USB stick into the infected computer, Shattered Assurance, a server tool infects the USB drive with a separate malware, called Drifting Deadline (also known as 'Emotional Simian' in the latest version). The USB drive infects with the help of a flaw in the Microsoft Windows operating system that can be exploited by hand-crafted link files (.lnk) to load and execute programs (DLLs) without user interaction. "The .lnk file(s) must be viewed in windows explorer, and the tool will be auto-executed without any further input." the manual says. 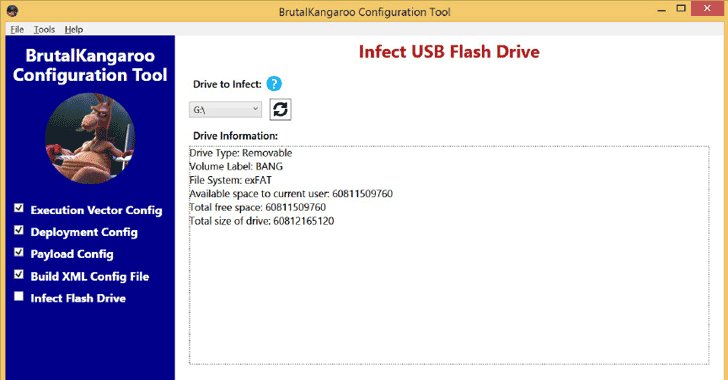 When the infected USB drive is used to share data with air-gapped computers, the malware spreads itself to those systems as well. "If multiple computers on the closed network are under CIA control, they form a covert network to coordinate tasks and data exchange. Although not explicitly stated in the documents, this method of compromising closed networks is very similar to how Stuxnet worked," WikiLeaks said. 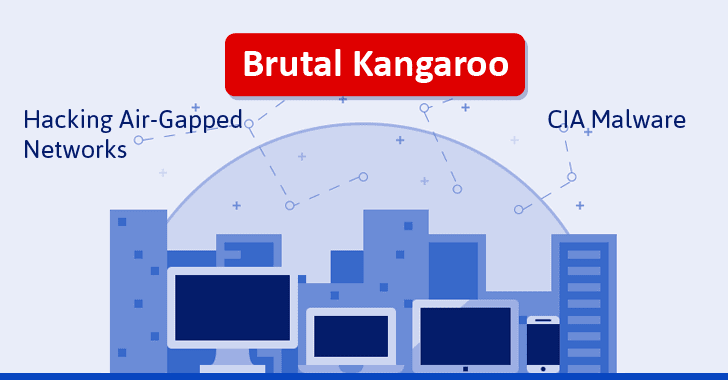 "Brutal Kangaroo components create a custom covert network within the target closed network and providing functionality for executing surveys, directory listings, and arbitrary executables," a leaked CIA manual reads. The malware then starts collecting data from infected air-gapped computers (which utilizes Shadow, the primary persistence mechanism) covertly and a module within the Brutal Kangaroo suit, dubbed "Broken Promise," analyzes the data for juiceful information. Last week, WikiLeaks dumped an alleged CIA framework used for monitoring the Internet activity of the targeted systems by exploiting vulnerabilities in Wi-Fi devices. Dubbed "Cherry Blossom," the framework was basically a remotely controllable firmware-based implant for wireless networking devices, including routers and wireless access points (APs), which exploits router vulnerabilities to gain unauthorized access and then replace the firmware with custom Cherry Blossom firmware. Athena – a spyware framework that has been designed to take full control over Windows PCs remotely, and works against every version of Microsoft's Windows operating systems, from Windows XP to Windows 10. AfterMidnight and Assassin – Two apparent CIA malware frameworks for the Windows platform that has been designed to monitor and report back activities of the infected remote host computer and execute malicious actions. 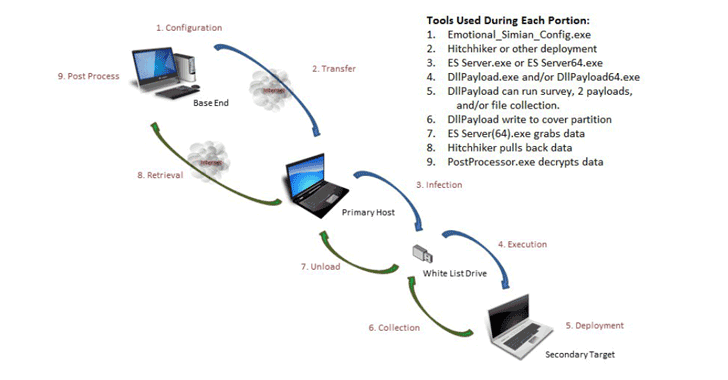 Archimedes – Man-in-the-Middle attack tool allegedly created by the CIA to target computers inside a Local Area Network (LAN). Scribbles – Software reportedly designed to embed 'web beacons' into confidential files and documents, allowing the agency to track whistleblowers and insiders. Grasshopper – A framework which allowed the agency to easily create custom malware for breaking into Windows operating system and bypassing antivirus protection. Marble – The source code of a secret anti-forensic framework, basically an obfuscator or a packer used by the spying agency to hide the actual source of its malware. Dark Matter – Revealed hacking exploits the CIA designed to target iPhones and Macs. Weeping Angel – A spying tool used by the CIA to infiltrate smart TV's and then transform them into covert microphones. Year Zero – Disclosed several CIA hacking exploits for popular hardware and software.